Bourbon Balls ~ an easy no-bake cookie that’s been a family favorite for generations. Grab a bottle of your favorite bourbon or rum and mix up these delicious grownup holiday treats. These lovely little gems are always a big hit wherever they pop-up. Bourbon Balls require no cooking and only a few happy ingredients. Our Bourbon Balls are super easy to make too. If you don’t get to them for Christmas, perhaps you can put them on your New Year’s Eve menu. Someone once told me not to use the “good stuff” to make these cookies. They suggested that I buy cheap bourbon or rum to use in recipes. 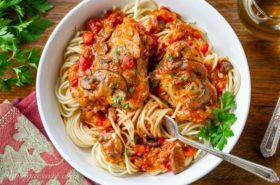 I thought about this for a while and believe they are totally wrong when it comes to this particular recipe. The smoother the firewater, the better the cookie, if you ask me. I like a good smooth bourbon anyway, but unfortunately I’m a lightweight when it comes to drinking. I can get a buzz from these cookies if I haven’t eaten a good breakfast! Be sure to grate your pecans for this recipe, it makes all the difference in the texture. Plus I’m not sure how much you’ll need if you use chopped pecans. To make it super easy, use a small cookie scoop to make these Bourbon Balls. Once you scoop out the dough, roll it firmly between your palms until they form a nice, tight, bite-sized ball. 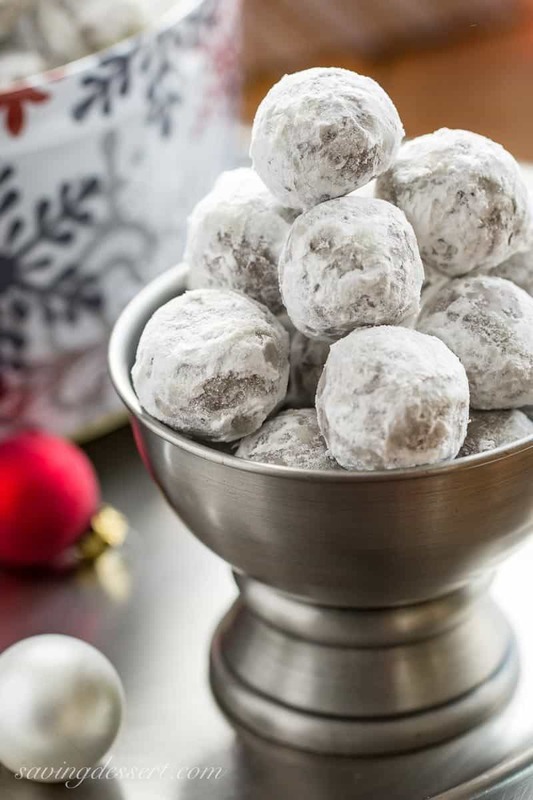 Roll the balls in powdered sugar and set them aside for about an hour. 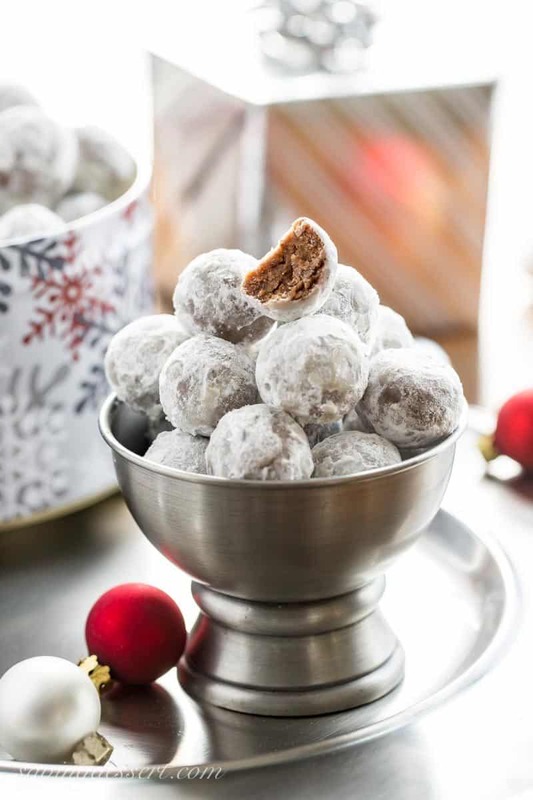 Re-roll the cookies in more powdered sugar and store in an air-tight container in a cold garage or refrigerator. These cookies are actually better the next day after the bourbon has had time to blend with the other ingredients. 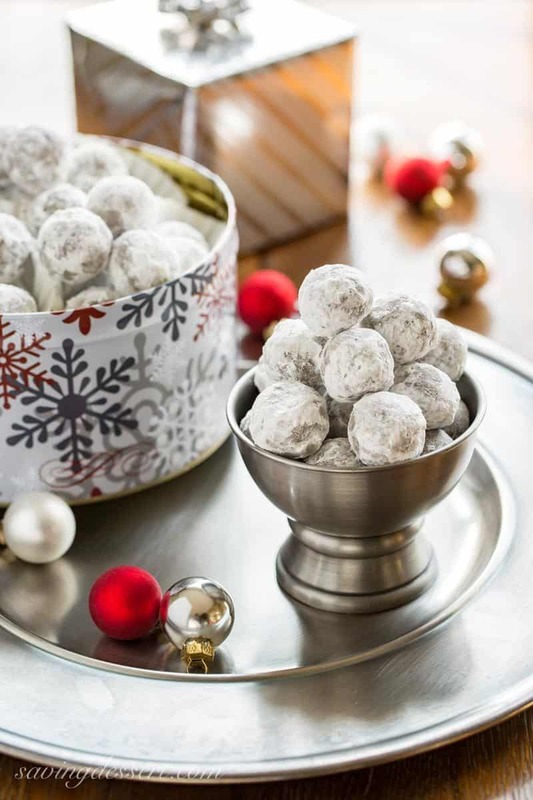 The Bourbon Balls can be bold and give you a little buzz if you eat too many, so take it easy especially at an office holiday party! These are our son’s favorite Christmas treats – so these are for him. Come and get ’em Patrick! 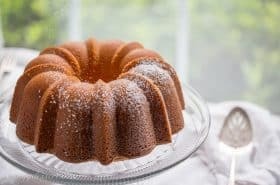 In a medium mixing bowl, combine the crushed vanilla wafers, ground pecans, 1 cup of the powdered sugar and the cocoa powder. Whisk to combine. In a 1-cup measuring cup, whisk together the corn syrup and bourbon. Add the bourbon mixture to the dry ingredients and fold together using a spatula until all ingredients are combined. It may seem dry at first, but keep mixing, it will all come together. Place 1 to 2 cups of powdered sugar in a flat bowl or rimmed plate. Roll the dough (firmly) into 1-inch balls (or use a small cookie scoop), then immediately roll in the powdered sugar. Place the cookies on a wax paper lined baking sheet. Continue rolling until all cookies are coated in powdered sugar. Set the cookies aside for 1 hour, then roll again in the powdered sugar. Store the bourbon balls in an airtight container in the refrigerator for up to 2 weeks. Notes: Be sure to use ground pecans, not chopped. We have a few recipes featuring bourbon so if you’re looking for more, check out our easy Chocolate Pecan Pie Bars with Bourbon & Sea Salt, and this creamy, smooth Butterscotch-Bourbon Pudding. If you’re crazy for nuts, you’re going to love this Bourbon & Butterscotch Nut Tart – so delicious! I really want to whip up a batch of these Bourbon Salted Caramel Candy from A Spicy Perspective. And, last but certainly not least, head over to The View from Great Island and drool over her beautiful Black Bottom Bourbon Pecan Pie, wow! Happy shopping and baking my friends! Thanks so much for stopping by. Is there a substitute I could use for the pecans? Tree nut allergy here. Hi Laura. I am not really sure what would be a good substitute other than ground flax seed maybe. That’s a tough one! So sorry about your allergies. I’ll keep searching but you may know better than me what would be a good substitute. This recipe needs something in place of the ground nuts. Good luck and sorry I’m not more help. 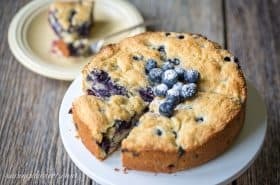 These are absolutely wonderful and very easy to make. I made them during the holidays and have been asked for the recipe several times. Think I’ll not wait long before I make up another batch. Thanks! Yeah! Thanks so much for the feedback Lorraine. 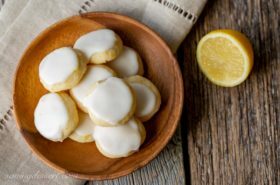 These have been in our family for decades – a favorite every year but I agree we should not wait until the holidays to make another batch 🙂 Thanks again for trying our recipe! Such a cute story about sneaking out in the garage 🙂 These look fabulous! Thanks Susan – we were busy kids for sure 🙂 Hope you have a wonderful, blessed Christmas! 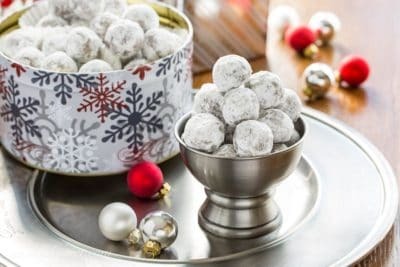 Would you believe I have never had rum or bourbon balls (nut allergy), but I do remember my mom made rum balls that everyone loved. Your photos, as usual, are gorgeous. Well worth the update ! I bet these would make very welcome gifts! Thanks Wendy! Hope you are enjoying a lovely holiday season and Happy Hanukkah to you and your family! Bourbon is always a good idea too – thanks Jennifer! How different with vanilla wafers!Thanks Tricia..so festive! I found my Mother’s recipe for Burbon Balls – she did not use cocoa powder. Have you tried these without cocoa powder? I can’t find any recipes without it – just wonder if she her re pie is wrong? Hi Janet – no I have not tried making them without cocoa powder, but a blogger friend of mine made them with Chocolate Nabisco Wafer Cookies (see her recipe here: https://theviewfromgreatisland.com/readers-recipes-no-bake-bourbon-balls/) I think they would be fine without the cocoa. I personally want to try them with more chocolate / cocoa. I don’t think her recipe is wrong, just different. Maybe somebody didn’t like chocolate – but that’s not me haha. Happy holidays! 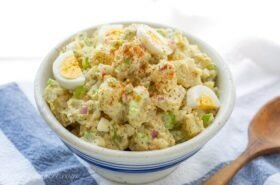 I always have my eye on these little gems and look forward to making them sometime this week. Hey Liz! Merry Christmas to you and yours 🙂 Thanks so much for stopping by! I’d have to hide these from my kids and myself. And definitely keep count of them 🙂 They’re beautiful Tricia and sound amazing! Oh gosh, I’m afraid once I started on these I wouldn’t be able to control the situation ~ pinning and sharing these little gems! I haven’t had these in 100 years and yours look delicious. Thank I hope you get the chance to make these soon Larry 🙂 Enjoy! Super easy and delicious..I guess other quality liquor would work too..for example Cognac? Cognac sounds wonderful Angie – let me know if you try it 🙂 Enjoy! How many does this approximately make? Hi Eryn – great question. I believe it is about 42-46 cookies. They are small bite sized balls so depending on how large you make them, your final count may be different. These are a treat for sure! I’ll update the recipe when I make them this year. Sorry and thanks! Has anyone used graham cracker crumbs as a substitute? Hi Joy! I think this is a brilliant idea! I’ve never tried it and am not sure if others have as well. But we’ll put this out there for our readers and hope someone can help. I’ve used rum or bourbon and both are great. I am partial to bourbon, but only as a personal preference. People ask me to make these year after year. They can be a little strong – but in a good way 🙂 Enjoy and thank you so much for the terrific question. Have a happy Thanksgiving and a wonderful holiday season! Thanks so much for commenting and for visiting. Graham cracker crumbs work but vanilla wafers add a whole new level of flavor. My absolute favorite thing to use, however, are the little crispy gingerbread men you find around the holidays. Oh that sounds greats Brent – thanks for sharing! Making these for my husbands "whiskey themed" birthday party as take home favors. Thanks for all the info!